What I like best about being a pediatrician is the relationships I form with families – both the kids and parents. I really enjoy watching kids and families grow over the years. I encourage family involvement in decision making and like when you ask questions and want to be informed. Families often teach me things as well!" Dr. Ell was raised in Eugene. She ventured north for college at the University of Portland, and continued onto medical school at Oregon Health & Sciences University. Before joining Metropolitan Pediatrics, she practiced at Oregon Pediatrics for several years. 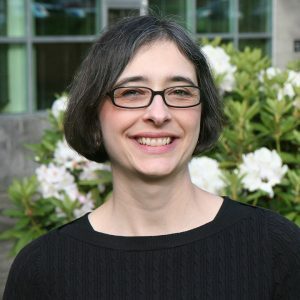 Dr. Ell lives in North Portland with her husband Pat and three children. When away from work, Dr. Ell can usually be found at home with her family, at her neighborhood Catholic Church, or on the sidelines at her children’s sporting events. She leads a very busy life and would not have it any other way! In her precious downtime, she enjoys hiking and baking. "My kids have been in this clinic for the past 4 years with Dr. Ell. She is sweet and caring and always treats me and my children with respect and dignity! The support staff there is pretty amazing as well!" "Dr. Ell is amazing! She listens and respects me as a parent & remembers my family. The kids and I adore her!" "We have 3 kids who go here and we love this place. We love Dr. Kristen Ell as well as the other providers we've seen. Everyone is professional, efficient, friendly, and accomodating."